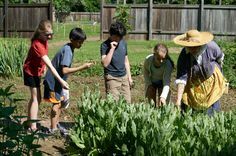 It’s been a great summer for our garden here at Pennsbury Manor! Because of all the rain, our summer harvest is growing quickly and will need to be harvested in the next few weeks. This would have been fantastic news in the 17th Century. By harvesting the summer crops quickly, they have more time to turn over the beds and replant the next crop. They wouldn’t want to waste a single day of warm weather, since what they can cultivate during the spring, summer, and fall will determine how much food they have to last the winter. For those of us whose summer BBQ’s wouldn’t be the same without some tangy horseradish, check out the amazing crop growing near the garden cistern! Horseradish is one of those plants that can be continually harvested as needed, so it needs some good protection from the bunnies who like to tour our Kitchen Garden! The fencing shown here is called “wattle fencing” and uses the flexible branches trimmed off of the apple trees in the spring. It’s a wonderful way to use the resources of the garden while also created a sturdy protection for your crops. Most of our field crops – barley, buckwheat, oats, wheat, and rye – were just harvested. Grains were an essential part of the colonists’ diet and could be dried and stored away to use throughout the winter. The last one we’ll harvest will be the flax, which gets pulled up by the root and used as a fiber in making linen. 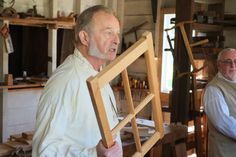 Most farms wouldn’t make their own linen, but they could grow it and sell it to the nearby cottage industries, who would then break the reeds, comb out the fibers, and weave on a loom. Our white pattypan squash has taken over one of the garden beds, it’s gorgeous! Pattypan is an early squash, you can see they are starting to blossom and will hopefully have a large harvest. Next up will be another planting of beans, radishes, beets, and yellow crookneck squash which wil be harvest this fall. Chives are a great plant to grow in the Kitchen Garden, since you can chop off the stalks and it will keep growing back all season. Mustard Greens are another constant resource that can be picked anytime, and they are self-sewn and easy to grow. But some plants take a longer time to mature. Our asparagus is still in its first year of growth, so we’re not ready to harvest this year. Leaving the asparagus shoots alone for 2-3 years before harvesting means you will have a much bigger yield with larger stalks. But of course when living in the new colony, if the garden had a bad season and you were desperate for the food, you would have to harvest what you could to survive. Stay tuned this fall for more updates on our Kitchen Garden’s progress!